Medical studies have shown that the combination of pears, ginger and cucumber is an ideal one when it comes to body cleansing and strengthening. This excellent drink can help reduce body weight, speed up metabolism, nourish your body, and expel the toxins in your system. The sweet and juicy pears are a rich source of dietary fibers, which have a positive effect on the cardiovascular and the digestive tract. Ginger is beneficial because it has anti-cancer and anti-inflammatory properties. Cucumbers are rich with silica, a mineral in trace that promotes the maintenance and growth of connective tissue like elastin and collagen. Alkalizing, anti-inflammatory, anti-oxidant and detoxifying properties are just some of the benefits that this cucumber detox drink provides. Put all the ingredients in a juicer or a blender and mix them well. If you want a clear juice, then you should drain the mixture through a sieve or gauze. This cucumber detox drink is ideal for detoxification and weight loss. Consume it before meals, but never as a meal replacement. This incredibly refreshing beverage will also completely detox your body and eliminate the toxins accumulated within the cells. Prepare this pear cucumber detox drink and reach your goal- reduce the fat pads on the stomach, get healthier and increase your self-confidence next time you put your favorite clothes on. 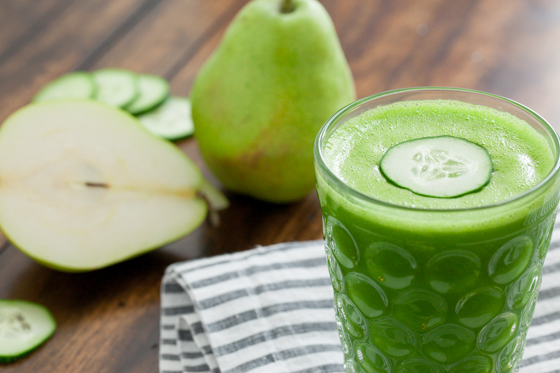 Enjoy in this simple and easy pear and cucumber detox drink!